Line the work surface with an old towel, one that you aren’t worried about staining. Place white paper onto the towel. Add green food coloring to a cup or dish with about an inch or so of water in it. Squeeze the food coloring bottle for about a second or two to get it nice and green. Stir it with your paintbrush. Paint each piece of paper with the tinted water. Paint the back side as well and let them dry completely. When dry, use a pencil to trace around hand and wrist onto the green paper. If you would like to add claws or fingernails, be sure to draw points at the ends of the fingers while tracing. Cut out the hand shapes. You can add black square shaped fingernails with a marker for a Frankenstein hand. You can use some red food coloring or a red marker to color in the fingernails for a witch look. Use rubber bands to attach the hands to the fronts of the jars. 1) If you prefer to stay away from real candles, you can use LED tea lights instead or glow sticks (though glow sticks only last a few hours). 2) If you like the glow of real candles, add a little clear tape to the hand near the top of the jar. This will help keep the hand sturdy and keep it from tipping over the top of the jar. 3) Using jars or glass vases that are as tall as your paper hands is the best bet to avoid the possibility of the top of the hand folding over the top of the jar. 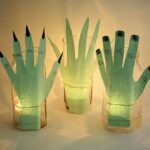 This project for Creepy Hand Luminaries for Halloween was printed from CraftsbyAmanda.com - https://craftsbyamanda.com/creepy-hand-luminaries-halloween/ and can only be printed for education or personal use.